Writer/producer Gene Roddenberry is famed as the creator of the original Star Trek TV series (1966-69) and for his involvement in much of its subsequent progeny, including such television series as Star Trek: The Next Generation, Star Trek: Deep Space Nine, Star Trek: Voyager, and Star Trek: Enterprise. He translated the original show onto the big screen in 1979 with Star Trek: The Motion Picture, and played an advisory role in later Trek films. The Roddenberry legacy also included such additions to English phraseology as "warp drive" as well as the massive fan phenomenon known as Trekkies. Born in El Paso in 1921, Roddenberry grew up in Los Angeles, where his father had moved to join the police force. As a teenager at Franklin High School he was a member of the debate team, played guitar, and practiced writing, concurrent with his avid interest in pulp fiction adventure stories and in similarly styled radio programs. After high school, Roddenberry seemed determined to set out on his own adventure. He took classes in police studies at Los Angeles City College, and in September 1940 he obtained his pilot's license. In July of the following year, as the U.S. trembled on the brink of World War II, he enrolled in the Army Air Corps, and after the Japanese bombing of Pearl Harbor he was called up to active duty. He completed training a Kelly Field, Texas, and received his commission as a Second Lieutenant. He married his high school girlfriend Eileen Rexroat, and was sent off to the Pacific. After the war, Roddenberry's next adventures were piloting for Pan American World Airways (and surviving a crash in the Syrian desert), and joining the LAPD. Although he was on the force from 1949 to 1956, most of Roddenberry's adventures here were limited to trading verbal volleys with a hot tempered police chief and jotting down the stories of beat cops. Roddenberry was himself part of the newspaper unit and spent most of his time crafting press releases, speeches, and otherwise assisting the department's transition to big city police department (with public image to match). Interestingly, another offshoot of this process was the department's representation in Jack Webb's popular television drama Dragnet. As the writer on the force (Roddenberry had tried to become a screenwriter before joining LAPD), he would help fellow officers draft their experiences into written outlines that could be submitted to Dragnet. He received half of their proceeds, amounting to $50 a pop, a handsome augmentation to his $400/month salary. But more significant than the monetary gains was the impact on his skill as a screenwriter. Watching the televised version of the stories he helped outline helped him understand how to develop a finished script. He also borrowed copies of these scripts from Webb in order to learn about stage direction, the framing of a scene, and so on. Soon he was again trying to write his own scripts. Although he never actually wrote for Dragnet, Roddenberry did get his big break with another law enforcement dramatization, Mr. District Attorney (under the pen name "Robert Wesley"). Soon he was branching out to other venues as well, including Goodyear Theatre, Naked City, the Kaiser Aluminum Hour, Four Star Theater, and others. Although he was able to handle his work for LAPD while writing (even passing his sergeant's exam), the time inevitably came when he had to stop being a cop who wrote and turn his full attention to being a screenwriter. Before developing the series that made him famous, Roddenberry worked on such shows as Have Gun, Will Travel (winning the Writers Guild Award for his "Helen of Abiginian" episode), and he even created and produced a show of his own: The Lieutenant, starring Gary Lockwood and Robert Vaughn. Meanwhile, ideas were beginning to form in his mind for a new kind of series, Star Trek. Despite it being a risky departure from anything done on television before (space adventures were for kids), he was sure his idea was a hit, but he would still need someone to bankroll it. Luckily for Roddenberry, CBS had given a huge wad of cash to I Love Lucy demigoddess Lucille Ball in order to entice her to continue their mutually profitable relationship. Lucy in turn invested the wad in Desilu Productions (co-owned with husband/co-star Desi Arnaz). And it was through Desilu that the pilot for Star Trek would be produced. Although the series found a permanent place in the heart of numerous television fans, it was axed after only three seasons. Network executives were less impressed with its futuristic message (a peaceful and united humanity, making the cosmos a better place through knowledge and technology) than its budget overruns ($8 an episode just for Mr. Spock's ear appliances). But Roddenberry would have the last laugh. Not only did his series go on to earn its expenditures many times over (in syndication), but it became the first television series to have an episode preserved in the Smithsonian (which also houses an 11-foot model of the U.S.S. Enterprise). After Star Trek's quasi-demise, Roddenberry went on to do other projects, including Pretty Maids All in a Row, Genesis II, The Questor Tapes, and the 1977 made-for-TV horror film Spectre. But none of these would ever have the same fame or cultural impact as Star Trek. In a way, the series had been part of the consciousness expansion of the 60s �- setting human dramas amidst the spectacle of strange new life forms whose needs and goals sometimes resonated with and sometimes confounded human expectations. And it had shown something that was still a radical new idea to many people in that era: woman and racial/ethnic minorities working as equals with white males. In fact, so radical was Roddenberry's original pitch for the show that it was rejected. The original concept called for Majel Barrett (who later became Roddenberry's real-life second wife) to play the part of "Number Two", the second highest-ranking officer on the bridge. This was deemed too shocking for mainstream America (and even the studio execs) and Barrett's role was rewritten into the second string character Nurse Chapel. Lt. Uhuru (Nichelle Nichols) did make it into the final version however, despite her being both a female officer and an African American. And although she was often portrayed as a kind of advanced telephone operator for the Enterprise, it is worth noting that she performed kissing scenes with white co-star William Shatner -- something that would be taken for granted a mere decade later. Roddenberry meanwhile was a humanist who believed that humankind had created most of its own problems and could, through applied intelligence, uncreate them. Roddenberry did not himself invest much belief in God. But he did allow his characters, in the world of Star Trek, the dignity of their own beliefs (a fact more obvious in the Next Generation era), and he stubbornly resisted the effort of network execs to put a Christian chaplain on the crew of the Enterprise. It would be ludicrous, he argued, to pretend that all other religions would have become obliterated by this point, or that such a cosmopolitan people would impose one group's religion on all the rest of the crew. However, it is worth noting that not all of the show's ideas belonged to Roddenberry. In fact, some writers on the show have claimed that ideas that they themselves developed were later passed off by Roddenberry as his own. Roddenberry was later confronted by these same writers, and apologized to them, yet according to his critics, he continued to spout the same false claims. Other scandalmongers have tried to make much out of an affair between Nichelle Nichols (Uhuru) and Roddenberry, yet both freely admitted the affair. Most interesting is the fact that Nichols has said that their relationship may have helped her land a role on the show. By the mid 70s (after the success of Star Wars), the Star Trek mythos had become so firmly entrenched in American culture (NASA named its first space shuttle Enterprise in honor Captain Kirk's vessel), and special effects technology had so advanced, that the public yearning for a new, updated version of the original concept was finally catered to. In 1979 Star Trek: The Motion Picture was released. Roddenberry's novelization of Star Trek: The Motion Picture (Pocket Books, 1979) sold close to a million copies and was ranked number one on national best seller lists for many weeks. In 1987 Star Trek: The Next Generation debuted to great success, further updating the original Roddenberry concepts and replacing some of them with more mature ones; for instance, the violent machismo of Captain Kirk gave way to the erudite patience and panache of Picard. On 4 September 1986, Gene Roddenberry's fans presented him with a star on the Hollywood Walk of Fame, the first writer/producer to be so honored. Star Trek: The Next Generation, in its first year in syndication, was awarded with the 1987 Peabody Award for the "Best of the Best". Since then, the Trek cosmos has taken on a life of its own, spawning a host of novels, television series, and films, not to mention endless fan conventions. 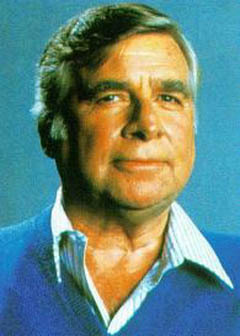 Roddenberry died from heart failure on 24 October 1991. One year later, a container of his ashes were sent into space about the space shuttle Columbia. Roddenberry's name now graces a crater on Mars and an asteroid, 4659Roddenberry.